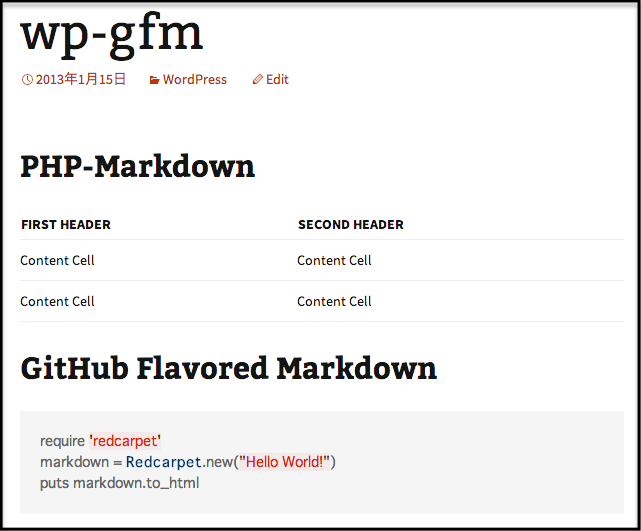 wp-gfm is the WordPress plugin that convert from GitHub Flavored Markdown by using the PHP-Markdown or GitHub Render API. The plugin has two conversions. [markdown] as shortcode for PHP-Markdown, convert by using \Michelf\Markdown class inside WordPress. This conversion depends on PHP Markdown Lib 1.7.0. Use [markdown][/markdown] as shortcode on entry. Supported embed markdown file by [embed_markdown] shortcode. You can use google-code-prettify if you want to allow syntax highlighting. This way is not good. If there are 5 shortcodes in page, the plugin require 5 HTTP requests. Use [gfm][/gfm] as shortcode on entry.